Sometimes there's a cost for doing the right thing," says Captain Norstad after standing up to a swindler. But the cost is high-the possible loss of the Christina. Will he and the other Freedom Seekers recover the stolen money before a double payment is due? When Libby's Newfoundland dog Samson saves a deaf child from being run over by a horse and buggy, Peter becomes part of the Christina family. Then a different theft threatens Jordan's reputation. The money entrusted by his church to help fugitive slaves cross into Canada is gone!&And will Jordan find his father before they're lost to each other forever? As the Christina steams south, Caleb learns that Micah Parker has escaped toward the Mississippi River. Who will find Micah first-Jordan or the slave catchers? Leaving the Christina at Alton, Libby, Caleb, Jordan, and Peter take up the dangerous search and receive the help of the Underground Railroad in Illinois. What does it mean to Caleb to hear what his hero, newspaper editor Elijah Lovejoy, believed about freedom of the press?&How did people in the Underground Railroad live their belief that when man's law and God's law conflict, God's law is higher, more important? The law to be followed. 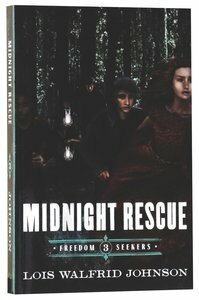 In The Swindler's Treasure, the fourth Freedom Seekers novel, Lois Walfrid Johnson brings into the story the thoughts of historic Illinois residents who give their reasons for being active participants in the Underground Railroad. About "The Swindler's Treasure (#04 in Freedom Seekers Series)"